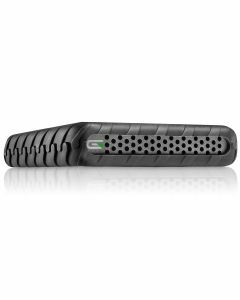 The Blackbox Plus is a rugged, mobile hard drive designed for creative professionals. Features the latest USB-C technology, optimized passive cooling, integrated health monitoring, and built to take a beating. As with all USB-C (3.1 gen 2) drives, the Blackbox Plus is fully compatible with USB3.0 and 2.0 as well Thunderbolt 3 computers - Glyph also provide a USB-C to USB-C cable as well as a USB-C to USB-3.0 cable for universal connectivity. The 500GB & 1TB HDDs spin at 7200 RPM and the 2TB spins at 5400 RPM. Blackbox Plus ships formatted to Mac but is fully compatible with Windows via a simple re-formatting. 0.8" x 3.7" x 5.75"